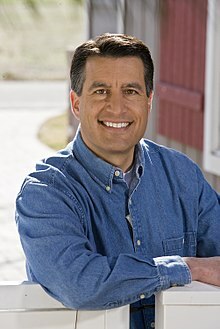 Brian Edward Sandoval (; born August 5, 1963) is an American politician and former attorney who served as the 29th Governor of Nevada from 2011 to 2019. A member of the Republican Party, Sandoval is a former United States District Judge of the United States District Court for the District of Nevada. On June 9, 2010, he defeated incumbent Governor Jim Gibbons to win the Republican nomination for the 2010 gubernatorial election. Prior to his service as a federal judge, he served as the 30th Attorney General of Nevada, the youngest chairman of the Gaming Commission of Nevada and a state legislator. I do not support driver's licenses for undocumented immigrants. My father was one of ten children. I'm a strong supporter of states' rights to do what they need. I do not support amnesty. I do not support driver's licenses for undocumented immigrants. For me, public service is an honor, and I have the ultimate respect for the rule of law. Fiscally I'm very conservative... others say that I'm socially moderate. I was elected to solve problems, and I don't think it's conservative to have bad roads; I don't think it's conservative to have bad schools. I don't think it's conservative to have to go through budget crises every two years. So I'm taking the difficult issues straight on. That's what I was elected to do. I've made a commitment that any tax increase, I'm going to veto. It's the worst thing we could do. We have an amount of money to spend. That's it. I worked my way through law school. Fiscally, I'm very conservative... others say that I'm socially moderate. As a former judge, I listen to all the facts, and I make a decision as to what I believe is in the best interest of the state. Fortunately, good policy, true principles, and effective leadership work whenever they are tried. When we reduce government, balance budgets, and keep taxes as low as possible, states respond in a positive way. If you're making everybody happy, you're lying to somebody. People have their constitutional right to contribute to a campaign and if they have discretionary money that they want to contribute to a candidate, whether a Republican or a Democrat, they should be able to do so. Racial profiling is illegal, and I do not support it. We have overcome economic devastation, defeated mighty oppressors, and lifted up generation after generation of Americans. We can - and we will - do it again. For that is our birthright as members of the American family - white, black, Hispanic, Asian, immigrant, or descendant of the Founding Fathers themselves. Good executives, like all good leaders, must expect opposition when making decisions or when making or enforcing the law. But executives must engage those that disagree with them. As governor, part of my job is to tell people things they don't like to hear. I registered as a Republican when I turned 18 because of Ronald Reagan - he was the president at the time; I admired what he stood for. I respected him. It's no accident that the fastest growing states with the best economies are all led by Republican governors. My first job was cleaning sheep pens. I am proud of my heritage and my family. Unemployment, foreclosures, bankruptcy - the cure is not more government spending, but helping businesses create jobs. I don't think it's any secret I've never been an advocate for the Affordable Care Act. Changing course is never easy.